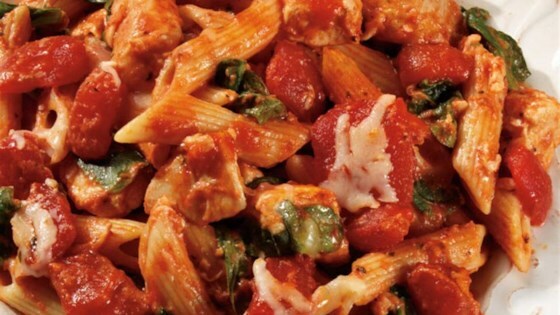 "Savory chicken, fresh spinach, penne pasta, basil and creamy cheeses are baked together in this simple and fresh chicken dish. Serve with a salad and warm bread for an easy weeknight meal!" Preheat oven to 375 degrees F. Cook pasta as directed on package and add spinach during the last minute of cooking time. Drain after cooking. Cook and stir chicken and basil in a large skillet, sprayed with cook spray, on medium-high heat for 3 minutes. Stir in pasta sauce and Red Gold Diced Tomatoes; bring to a boil. Simmer on low for 3 minutes or until chicken is done. Stir in Neufchatel cheese, pasta mixture and 1/2 cup mozzarella cheese. Spoon into a greased 2 quart casserole dish. Bake for 20 minutes and then top with remaining mozzarella and Parmesan cheeses. Bake an additional 3 minutes or until cheese are melted. See how to make Greek chicken with feta cheese and artichokes. I absolutely loved this recipe. The only thing I did differently was season the chicken with garlic and herb/ seasoned salt to make it more flavorful. My husband LOVES it. Thank you!!!! I did pretty much what the recipe called for but I used rotisserie chicken. It seemed to come out more juicy. It was a pleasant dish. My family seemed to really enjoy it. This was a definite hit with my entire family! I made a double batch and froze half for another meal. My kids all loved it and had at least two helpings each.